Privalia is a well-known e-business company in the Spanish speaking market. This Catalan company earned more than 554 million USD (422.5 million EUR) in 2012 from sales to its members. With more 15 million members, it maintains its top position in the fashion market. In this market, players move quickly, just like in football. “Not paying attention for a few months can mean losing a competitive position,” says Albert Serrano, director of Privalia Mexico. Serrano, who has been in Privalia for three years, knows this from experience. The Barcelona-born director played on Barça’s second division team before joining the digital revolution. “I preferred working in Privalia to playing football with Barça,” he affirms. Although the two professions may seem very different, Serrano’s experience with Barça has helped him in the corporate world. “In e-business, what works today won’t work tomorrow. In football, you know that even if you are world champion one year, you’re back to square one again the next year,” Serrano points out. 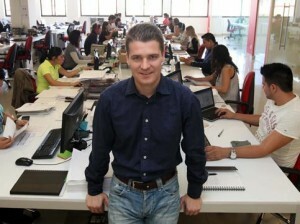 He has been managing Privalia Mexico since November 2012, when Miguel Giribet was promoted to director of Privalia Spain. “Many Internet-based companies are launched and disappear quickly because doing a job well costs money, and requires a substantial investment as well as a talented team,” Serrano says. As a former Barça player, Albert Serrano was not able to see his team win the Eurocup. However, his success as a business leader was marked by Privalia being named the Best e-Business Site with the Best Digital Advertising Campaign in Mexico by the Asociación Mexicana de Internet (Amipci). Do you want to go to Silicon Valley California?